I remind any journalists reading that as ever, my personal blog may not represent the PTUA’s views. Starting in February, retail outlets (primarily 7/11s) will start to sell Myki and do topups. They’re switching from Metcard, eg no more Metcard sales from those outlets. Weeklies/Monthlies will no longer be sold at station Metcard machines or booking offices from March 26th or thereabouts, and given retail outlets will be switching over, that’ll mean they effectively disappear from sale. 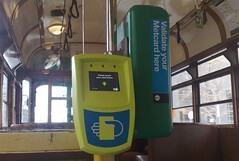 Metcard validators will stay around for some time to come, allowing Metcards to be used up, though the balance may start to change as users switch over. They can’t run the two ticketing systems forever side by side, and given the premise that Myki is not being scrapped, and yes, Metcard needs to be removed at some point, this is probably reasonable to push the rollout along, but the concern will be if staff are available where needed. There seems to be a hint of a “big bang” approach to stopping sales of weekly and monthly Metcards, and they’ll only have enough staff to do about 50-70 locations at a time, so some stations may not have any staff to help when the switch is on in earnest. A better approach would to do line-by-line with staff on hand. They also need to make sure people realise Myki has an (almost) identically priced unlimited-travel alternative fare to the Metcard Weekly and Monthly tickets, because it appears not everyone is aware. Still no word of any single use ticket option. No word on fixing things like the identical touch-on/touch-off beeps, which slows people down. It has emerged that topups will be available on Melbourne buses. This is good, given users in suburbs with no easily-accessible retail outlet, but it’s unclear however if they will restrict the amounts (eg $5 increments as in Brisbane) to reduce instances of people topping up one fare at a time, which would defeat much of the purpose of having a Smartcard system. But it’s unclear how the transition will be handled for buses and trams. It could get ugly if one day passengers go to board their service without having yet got a Myki and find there is no Metcard option anymore. Oh, and it’s been mentioned that currently Myki accounts for about 30% of ticket validations in Melbourne, with the system taking about 1.8 million passenger trips per day. So of course they have to make sure all the equipment is reliable and consistently fast as that load moves from 30% up towards 100%. ← Previous Previous post: Coin deposit reduces dumped shopping trolleys – why don’t they all do it? Can’t buy a concession ticket !!!!!! Obviously the Govt wants to encourage fare evasion among the legitimate concession holders. 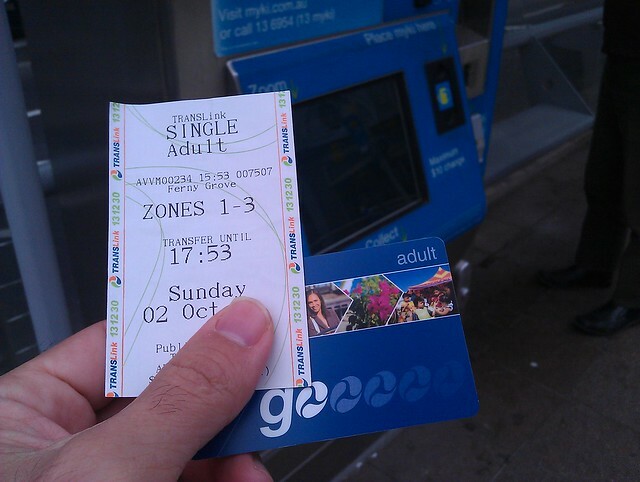 There is still no easy way to swap from full fare to concession or back again. The ability to purchase a myki card at a train station is long overdue, now they just need to waive the $6 startup fee when $30 or more of credit is loaded. Would like to see a mobile app which allowed you to check your balance, trip record and top-up also. There still seems to be an issue with the barriers at stations where myki cards are not reading correctly – I don’t know if this is the fault of the technology or the people using it. At any rate, it causes quite the backlog at Southern Cross during the morning peak. The proposal to make people buying a concession card is bizarre considering that now when you buy a concession MYKI from a human they don’t want to sight your documentation. When I asked about this I was told that if it wasn’t legitimate I would be caught by a ticket inspector. The frankenbarrier issue is alive and well. Hopefully rapid rollout of more myki barriers will speed things up (and, if they’re less congested than metcard barriers, encourage switchover too). The concession card issue is crazy and I’ve commented before and will do again, there is NO point having separately branded concession myki cards. The cards’ validity can only be checked electronically, at which point its concession status can be too. Concession status should be able to be ‘flipped’ electronically as needed, either by station agents on receipt of concession proof, or the other way by pretty much any authorised myki administrator. The touch on/off beeps are another simple issue easily resolved, as is the continued dual printing of receipts (myki machine: do you want a receipt? Hit no- still get one). The wording just needs to be changed to reflect you will always get an EFT receipt if you paid that way (or simply combine the receipts, as do Coles / Safeway etc). Finally it’s still ridiculous that you can buy up to two passes, but can’t choose when to activate them (especially given if topping up a pass online you have no idea when it might arrive). It means if you have a pending pass, you can’t take advantage of weekend saver fares if touching on the weekend – tough luck, your pass starts NOW. Why not have a touch-hold – do you want to activate pass – touch again (or similar) to activate a pass, otherwise myki money is the default. Solution: buy a second myki that you use for myki money – not looking so smart, and the exact problem (always getting best fare, not carrying around earlybird, monthly, sunday saver and 10x2hourly metcard) myki was meant to solve. @PaulK – what you can’t buy is a concession MyKi card from those locations. Once you’ve got one, you CAN top it up at those locations. The reason you can’t buy a concession myki from a vending machine is that they only have one card stack and can therefore only store and dispense one type of card. Concession mykis are factory-printed with the concession type (‘CH’ for child, ‘C’ for general concession etc) and the machine has no way of dealing with these different physical stocks. I was using metcard to get to the end of the Epping line at one point a few months back – my metcard was zone 1 only, so to make up the difference I bought a zone 2 2hour ticket when I arrived at the other end (whether or not that was the correct order to do things, I am not sure) … anyway, how would I perform the same sort of thing with myki if I’ve got a zone 1 yearly myki card? Do I just touch on and then touch off at the other end and it magically Just Works or do I need to do something special? @malcolm, that’s one thing that magically just works. @malcom – sorry, to add: it will magically just work if you have ‘myki money’ on the card. If touching off in Zone 2 puts your ‘myki money’ into the negative, even just a cent, you won’t be able to touch on again – even with your $1000+ valid yearly pass on the same card. You’ll have to topup the money component to be able to use your valid pass, the value of which will nearly always outweigh any negative ‘myki money’ balance. I could understand this rule if the myki was in a net negative balance (remaining pass value + money balance <0), but not for the overall positive balance scenario. It's also something most station staff, to date, are fully aware of (in my experience). However I couldn’t even buy a new myki the way I wanted. If I want to register it I have to create a whole new account with new login details etc. So I logged in, but there is nowhere to buy a new card, once you are logged in. @PaulK, log into your account, then use the Get Myki link there’s an option to add the new card you’re ordering to your account. Or you should be able to buy a card over-the-counter and register it to your existing account. If they want people to use Myki just make it cheaper to use. Put up the price of metcard (dollar a week extra?) and magically in about 6 months most people will using Myki and there will be no fuss or media beat up (assuming the Myki infrastructure can cope – I have not seen a system any where in the world that takes as long to validate a card). 6. Metcard is a monopoly by Onelink – they designed it, they supply parts and maintenance. Myki is different because spare parts can be obtained on the market, so we can look for cheaper options after the original contract expires. That’s just some of the reasons. Given more time, I’m sure I could think of many more. Of course, Myki isn’t perfect and it has a whole host of problems, but generally speaking they’re easier, faster and cheaper to fix than problems with Metcard. Thanks Daniel. It worked OK and I’ve ordered my Myki. @Dave, without thinking about it I swiped off in Zone 2 even though I have a Zone 1 yearly. No indication at the station barriers that anything was amiss, but I went $2.08 into the negative. Couldn’t swipe on the next few times, got frustrated because the barriers did nothing, so I assumed it was a barrier problem. Eventually, rather than just letting me through, a guard checked my balance and that’s when it all made sense. I would have clued on so much earlier if the barriers had made a different beep (like an unvalidated Metcard) or something to alert me to check my Myki. I actually spoke to Myki customer service today though and they said that once all the barriers are replaced with proper Myki barriers, things will work better. Another question I asked was what do I do when my yearly expires but I don’t want to activate my new Commuter Club Yearly as I am heading overseas for a couple months and want to use a monthyl or Myki money in the meantime. The station staff said I should put Myki money on the card and then the Yearly wouldn’t activate, but the woman on the phone said I would need to get a separate Myki and use that until I was ready to activate my yearly. Confusing and hard from this perspective but since I have had my yearly Myki I have not had a worry other than the odd barrier refusing to acknowledge me. @Liz, as you’ve discovered, it’s worth putting a few dollars on your card even if you have a yearly fare loaded, just to avoid that problem. There is actually a beep at the gates, but it’s almost inaudible. They are correct in saying that the proper Myki barriers will be more helpful, with a visual prompt/display of your balance. Yes, you would need to get a separate Myki if you want to save your Yearly Pass for later, as a Pass will always activate first if the travel you’re making is in that zone. It’s worth the $6 though. I love that the station staff said the yearly wouldn’t activate. I don’t blame them for being wrong; I’d like to know how much training was provided, and complicated by the lack of intuitive use (why does a pass activate immediately without question – it’s like the metcards validating straight away from tram machines, but not station machines – just adds to confusion). In defence of my station staff at Ormond, Skevi and Sharon, they always take these things on board and raise them at their staff meetings to get them ironed out. In fact, Skevi immediately called customer service for me on the station phone and helped me sort it out. The communication issues are at a much higher level as sometimes I get SMS’s about cancellations that they don’t know about and vice versa. Sometimes they get told of a cancellation and then the train turns up anyway! All up, they are doing a great job with the resources they have! When you “hear about a cancellation” and the train “turns up anyway”, it is probably an earlier train running 20 minutes late. Wow, Myki ordered on Saturday was delivered in the mail today.!! Myki customer service is so horrible that they can’t even help me to detele a card of my account as I have to wait for a half an hour to reach a resolutions officer. I tell you what’s worst? The bloody myki ticket machine aren’t working. Not only Kamco is doing a bad job, so as Aegis who handle’s myki customers calls they are doing much shitie job as well. Both of them can’t even fix a fault ticket machine for months and nothing have being done about them. @Aaron, not a complete solution, but the phone app “Consume” allows you to configure a Myki account and check your balance on the go.